The staff at Dive Magic have more than 80 years combined instruction experience. Whether you are ready to get into the water the first time or want to pursue a life as a PADI instructor we offer all the classes in between. Our indoor, year round pool facilities offer swim instruction for infant, kids, and adults. Ages 6 months to adults. We offer both private and group instruction. All sessions are a half hour long. We are proud to offer a number of opportunities for kids to begin enjoying the water from as early as age 5 all the way up to 15 years old. Students can enroll for Supplied Air Snorkeling for Youth (SASY), PADI Bubblemaker™, PADI Seal Team, or the Junior Open Water Diver course. Breathing underwater for the first time is really cool, so check out our infosheet for more details. Want to learn to breathe underwater today! This is a fantastic way for those with NO EXPERIENCE to try out the wonderful world of scuba diving. Our all-inclusive 1 day introductory course is the perfect way to give Scuba Diving a try. You can be diving in as little as 1 hour! Class counts toward an Open Water Certification. Entry-level certification. This is an all-inclusive class so we provide everything you need, which includes classroom sessions, pool sessions, four open-water dives, all rental equipment, books, dive table/ ERDPml and certification card. We offer two regularly scheduled courses, a weekend course and a weeknight course. We also offer private courses, which cater to your schedule (call us for more details). Participant must be 10 years old or older, have adequate swimming skills and be in good physical health. Are you interested in dry suit diving, maybe want to perfect your buoyancy. Why stop your learning when you have just begun. Build upon your skills with a number of adventure dives that will help you complete your Advanced Open Water certification. Or, just enjoy a number of different adventure dives to find your speciality. This course builds upon the skills you learned in your Open Water course and further refines diving skills and introduces students to advanced diving under the supervision of a PADI instructor. Includes five dives, two of which must be deep dive and navigation dives... with the other three including night, wreck, drift, or AWARE Fish ID, among others. We offer Advanced courses all the time, in conjunction with the Open Water Schedule. During the Summer we offer Advanced dives every Wednesday Night during out “Get Wet Wednesdays” Participant must be a PADI (Junior) Open Water Diver, or equivalent, who is at least 12 years old or older. If you are interesting in extending your bottom time, then check out the Enriched Air Diver program. To enter the program, you’ll need to be 12 or older, and a certified Open Water Diver. The Enriched air program emphasizes the theoretical and operational considerations involved with enriched air diving. This course teaches you how to recognize diving-related injuries/symptoms and proper care for diving-related injuries. You will become well-versed in diving accident rescue and management. Must also be EFR Certified or had a CPR & First Aid course within past 24 months to meet the requirements of this certification. We can also teach you the PADI EFR class during the 3 days over which the Rescue Diver certification takes place for an additional $99.00. Online version is also available. We offer Rescue courses throughout the summer months, June, July, and August. 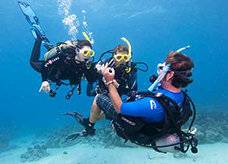 Participant must be a PADI (Junior) Adventure Diver, or equivalent, who is at least 12 years old or older and has completed the Underwater Navigation Adventure Dive. We offer 1 to 2 hour refresher courses with an instructor or without an instructor; as well as, with scuba gear or without scuba gear (if you have your own BC and regulator). We recommend that you consider at least the 2 hour refresher with an instructor if it has been more than 2 years since your last dive, or you have limited experience. In the refresher with an instructor, the instructor will remind you how to put together and take apart your gear, regulator recovery, and clearing skills. If you choose to complete a refresher without an instructor, you will get little guidance and basic dive procedures, but ultimately you will be refreshing on your own. Are you ready to take the first giant stride to become a PADI pro? Our Dive Master program will prepare you to conduct dive briefings, scuba reviews, and lead Discover Scuba programs and assist with training and leading in the water diving activities. If becoming a professional scuba diving instructor is a dream of yours, we can help that come true!